That very first baby tooth is an exciting milestone for many parents – usually appearing when your baby is between four and seven months old. However, some babies can be born with their first tooth, while others will start to teeth later than average. Remember that all babies are unique and will hit their milestones at their own pace! 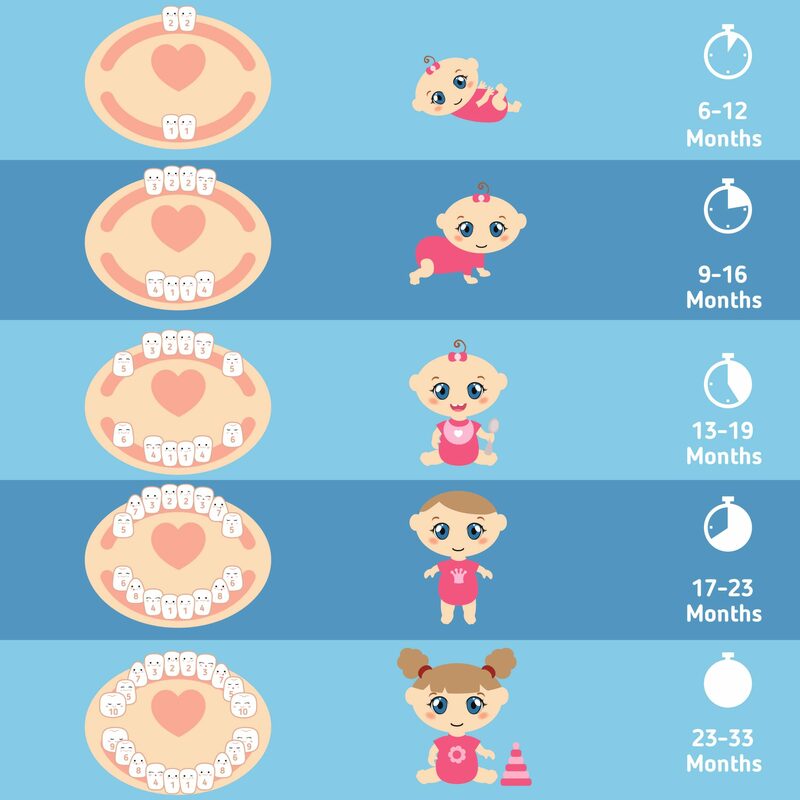 The American Dental Association (ADA) recommends that you take your baby for their first dental checkup either within six months of their first tooth appearing, or by their first birthday – whichever comes sooner. If your baby is showing no signs of teething by age one, your dentist or doctor can check that there are no issues to be concerned about. Of course, baby teething is an ongoing process. The front top and bottom teeth are usually the first to appear, while the second molars are often the last, breaking through at around two to three years old. While the primary teeth are breaking through, a teething baby can suffer some pain and discomfort. Let’s look at the signs of teething and what can be done to help ease your baby’s sore gums. Flushed cheeks (or just one cheek). Trying to bite and chew on objects. More irritable or difficult to settle than usual. Rubbing his face or grabbing his ears. Putting his hands in his mouth. While some people report their baby suffering from a raised temperature while teething, teething and fever do not necessarily go together. In fact, research by the American Academy of Pediatrics found that, while a slight rise in body temperature is normal for a teething baby, a true fever (of over 38℃ or 100.4℉) is not. If your baby has a fever, or other symptoms such as diarrhea, lack of appetite, lethargy or vomiting, seek medical advice from your doctor as soon as possible. What is the order of tooth eruption in infants? The following list shows the most typical order of tooth eruption in babies and children, although you shouldn’t be concerned if your baby’s teeth come through in a different order. If a tooth seems to be showing no signs of coming through as expected, however, your baby’s dentist can advise. Let your baby bite on a clean, safe teething toy (avoid teethers that contain liquid which could leak). Keep your baby’s teething ring in the fridge for extra relief. Chilled boiled water in a sippy cup, or cold fruit puree or yogurt, could also help soothe an older baby. They might also enjoy biting on the spoon! Teething gels are available but they’re thought to only offer very temporary relief. If you do decide to use a teething gel, make sure that it’s sugar-free and suitable for the age of your baby. Also ensure that you only use the amount instructed by your doctor. Once baby has his very first tooth, you’ll need to keep it clean! The UK National Health Service recommends using a tiny smear of fluoride toothpaste on a baby toothbrush. Get your baby used to the routine of tooth brushing to care for their smile and help develop good habits for when they’re older. Teething can be a difficult time for baby and parent, but teething pain should only be temporary. If your baby seems to be suffering for a prolonged period, or is very distressed, speak to your doctor.